The British Pound trades steady against the Euro but towards three-week lows against a resurgent U.S. Dollar which has taken heart from overnight news the U.S. government is likely to avoid another shutdown with Democrats and Republicans agreeing on a temporary funding solution for the southern border. The U.S. Dollar was also bid on comments from President Donald Trump that he remains confident a trade deal will be reached with China before a March 01 deadline with President saying "we're going to make great deals on trade" and "we don't want China to have a hard time." The Pound-to-Euro exchange rate is quoted at 1.1392 while the Pound-to-Dollar exchange rate is quoted at 1.2863. For Sterling, all eyes are on Prime Minister Theresa May who tells parliament she believes she can reach a deal her fellow MPs can vote through but they must hold their nerve in order to get a deal from the EU. May is laying out the path the government intends to follow over coming weeks, saying if no deal has been agreed with the EU before February 26 parliament will once again be given the opportunity to have a say on the way forward. For Sterling this is a positive outcome as the currency tends to trade with strength when the probability of a 'no deal' declines. May says she will remain open to talks with Labour party Jeremy Corbyn, but reiterates that Corbyn's demand for a customs union with the EU will be a non-starter. We continue to believe the best possible outcome for those wanting a stronger Pound over coming months would be the passing of May's Brexit deal as this would automatically erase a significant amount of uncertainty that hangs over the UK currency. May will however want to delay any final vote until the last minute to force parliament and the EU to yield when facing a 'no deal' Brexit. "Pound gains from earlier this year remain vulnerable to a further reversal the longer it takes to reach a Brexit deal. There is clearly a risk that 'No Deal' Brexit fears could intensify in the month ahead as time is quickly running out before the end of the Article 50 period," says Lee Hardman, a foreign exchange strategist with MUFG. Overnight, we hear reports that the meeting between senior negotiators Stephen Barclay and Michel Barnier saw "constructive and robust" discussions take place. No breakthrough was made, and negotiators confirmed they would be meeting again over coming days. UK high-street lender HSBC have raised their forecasts for the British Pound in 2019, saying the currency "gets our vote". The call for a stronger Pound is based on scenario modelling that tries to anticipate the eventual Brexit endgame. Under HSBC's current modelling three options are preferred: no deal, deal and no Brexit. 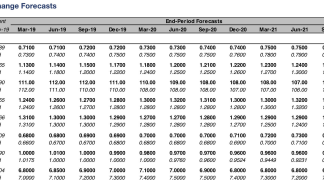 Each scenario has its own set of Sterling forecasts attached, and crucially, each scenario has a similar weighting. 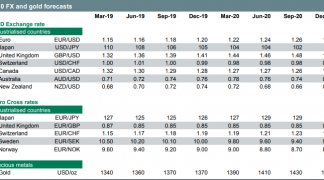 "We do not expect that everyone will agree with our decision to apply equal weightings to all three outcomes," says David Bloom, a currency analyst at HSBC in London. "We simply believe our equal weightings are the most plausible when uncertainty is so high and visibility on how Brexit will play out is so low." "We have long viewed GBP as a probability-weighted distribution of different outcomes. Prior to the vote on PM May’s deal with the EU, we simplified this to a binary choice between some form of Brexit deal and the alternative 'no deal' outcome. We argued a deal could see GBP/USD rally to 1.45, whereas a “no deal” outcome could see it fall to 1.10. With little clarity on which outcome was more likely, we attached identical probabilities to each, suggesting therefore that GBP/USD should trade roughly around 1.25 to 1.30." 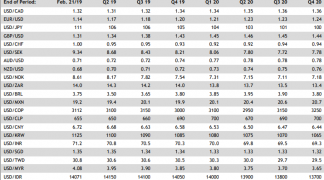 Since the Brexit deal was defeated by parliament in January, HSBC have taken another look at their models, and come to the conclusion that the Brexit outcome was no longer simply a binary outcome. A third possible outcome has been identified in the form of 'no Brexit'. "This would imply a complete reversal of the weakness evident since the EU referendum result, and could see GBP/USD revert towards 1.55, the level prevailing before Brexit was a focus for the market," says Bloom. Inject a third outcome into the model, and the forecast is naturally rises. How a 'no Brexit' might be achieved is not made clear, but Bloom does cite Prime Minister May and other members of government warning their Conservative party colleagues opposed to the Brexit deal that rejection of the deal could see the likelihood of 'no Brexit' rising. "So we can no longer think in binary terms. A third strand of possibilities has emerged that needs to incorporated in a more meaningful way following the scale of defeat for PM May’s deal and the subsequent strategy to shift to a cross-party process. The likelihood of “no Brexit” is moving from a distant prospect to a meaningful one," says Bloom. Blending together a 'no deal' outcome (1.10), a deal (1.45) and 'no Brexit' (1.55) would be consistent with GBP/USD around 1.37. 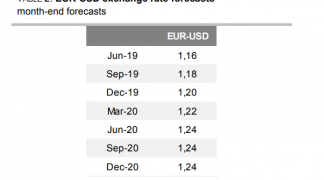 Previously HSBC had forecast the exchange rate to trade at 1.30 in 2019. The equivalent adjustment puts EUR/GBP at 0.80. This gives a GBP/EUR exchange rate of 1.25, making it an above consensus forecast and sharply higher than HSBC's previous forecast for 1.176. These forecasts are applied to the entire 2019 period. "Amid the gloom and uncertainty, GBP looks cheap on a risk-reward basis," says Bloom.